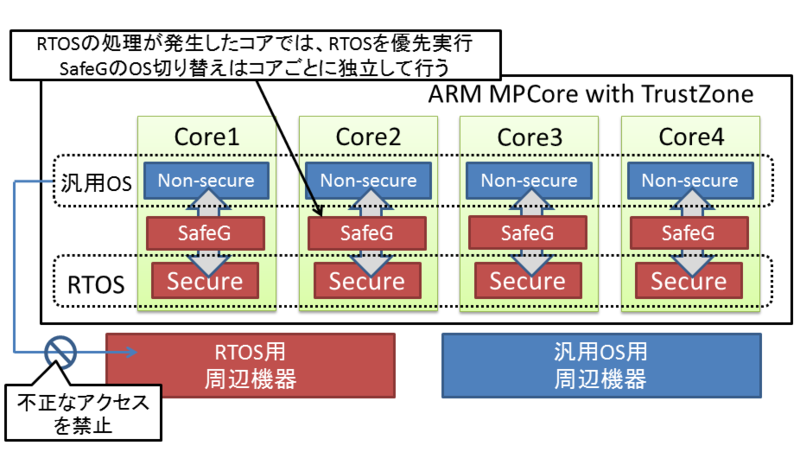 "Reliable Device Sharing Mechanisms for Dual-OS Embedded Trusted Computing", Daniel Sangorrin, Shinya Honda and Hiroaki Takada, Proceedings 5th International Conference on Trust and Trustworthy Computing, pp. 74-91, Vienna, Austria, Jun 2012. "Integrated Scheduling for a Reliable Dual-OS Monitor", Daniel Sangorrin, Shinya Honda and Hiroaki Takada, Journal of Information Processing ACS no.23 2012. "組込み向け高信頼デュアルOSモニタとそのマルチコア拡張"，太田貴也，Daniel Sangorrin，本田晋也，高田広章，第13回 組込みシステム技術に関するサマーワークショップ（SWEST13）ポスター，予稿集, 下呂市, Sep 2011. "Integrated Scheduling in a Real-Time Embedded Hypervisor", Daniel Sangorrin, Shinya Honda and Hiroaki Takada, 18th SIGEMB, Hakodate Mirai University, Aug 2010. Copyright (C) 2000 - 2019 by TOPPERS Project, Inc. All Rights Reserved.